PCB in bachelite per fuzz face anni ’60. Versione PNP al germanio, assemblato con componenti nos. Allo scopo vengono allegati (compreso nel prezzo) due transistor e cioè: un transistor SFT337 (Q1) (introvabile) che di questo pedale ne fa la differenza e un transistor AC128 (Q2), ORIGINALI che, su esplicita richiesta, potranno anche essere saldati al pcb. PCB in bachelite per fuzz face anni ’60, versione NPN silicio, assemblato con componenti nos e due bc108c selezionati. Allego comunque, a titolo di esempio, schema elettrico e disegno pratico per facilitarne la costruzione. Pcb in vetronite per fuzz face anni 60, versione pnp germanio. Disegno originale rispettato, misura 65mm x 40mm,già forato (non serigrafato). Soltanto il pcb.Questo in foto. Allego schema elettrico e pratico utili alla realizzazione. Pcb in bachelite per fuzz face anni 60, versione npn silicio. Disegno originale rispettato, misura 65mm x 40mm,già forato (non serigrafato). Soltanto il pcb.Questo in foto. Allego schema elettrico e pratico utili alla realizzazione. Pcb in vetronite per fuzz face anni 60, versione npn silicio. Disegno originale rispettato, misura 65mm x 40mm circa, già forato (non serigrafato). Allego schema elettrico e indicazioni pratiche utili alla realizzazione. Pcb in vetronite per fuzz face anni 60, versione npn silicio. Disegno originale rispettato, misura 65mm x 40mm,già forato (non serigrafato). Soltanto il pcb.Questo in foto. Allego schema elettrico e pratico utili alla realizzazione. The circuit is the original 1966 Ivor Arbiter design. It has audio grade electrolytic and polystyrene capacitors. All resistors are carbon film. It has professional quality jacks. Its hand wired into a larger style 1590bb Hammond enclosure. 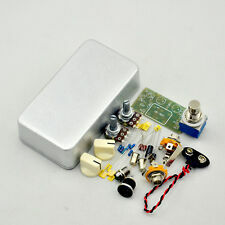 MAKE YOU OWN FUZZ FACE EFFECT PEDALS KITS AND PARTS(WITH 1590B BOX). 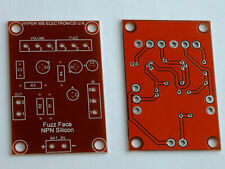 1-Ready To Solder FUZZ FACE PEDAL PCB. 2-All the required components to build this effect pedal Kit. 电 阻 R1 470Ω 1/4W 1. 电 阻 R5 33K 1/4W 1. Amazing Dallas Arbiter Fuzz Face Crest Audio era, by Dave Fox! Maybe one of the most beautiful Fuzz Face, that catch the essence of 60's sounds Fuzz! Do your research on this one. It’s a rare and classic pedal. It will only go up in value. Get it now! The pedal comes with to BC109 silicon transistors!!! Pots date to 2001. great used shape. Tested and working good. Tested and developed over several world tours, the JBF3 Joe Bonamassa Signature Fuzz Face is voiced specifically for Joe’s humbucker-driven tone, adding sustain and thickness for a rich, creamy fuzz. Beyond rare Denis Cornell First Fuzz #459 - with the incredibly rare & sought-after NOS 1960s NKT 275 White Dot transistors! The 1st Fuzz is really an original Fuzz Face fanatic’s Holy Grail - Guitarist Magazine. Please check out the YT demo we recorded at 'Pedal Pawn'. This unit is in mint condition with box & manual. Please see the attached high-resolution images as these form part of the items condition & originality description. Worldwide tracked shipping! 'Pedal Pawn' stock the UK's largest supply of vintage, rare & original stompboxes. Whether you're chasing your dream guitar pedal, or just simply want to nerd-out over gear - we'd love to hear from you at Pedal Pawn! Hand Made Point to Point FUZZ FACE Board and Kit with MULLARD OC81M black jacket germanium transistors. 2 x MULLARD OC81M germanium transistors (Q1 60 - 80 Hfe / Q2 100 - 120 Hfe). micro Point to point Board. The Dunlop Jimi Hendrix Fuzz Face Mini is a truly playable collectible for any Hendrix or Fuzz Face fanatic. Very good condition, with only slight scuffs visible to the finish. Box included! Please see the attached high-resolution images as these form part of the items condition & originality description. Worldwide tracked shipping! 'Pedal Pawn' stock the UK's largest supply of vintage, rare & original stompboxes. Whether you're chasing your dream guitar pedal, or just simply want to nerd-out over gear - we'd love to hear from you at Pedal Pawn! Fuzz Face / Distortion . Condition is Used. This Pedal was developed for Bobby Hecksher of the Warlocks. It’s a Fuzz & Distortion; 2 in one pedal, loosely based on a Fuzz Face & MXR Distortion specs. Extremely rare piece of Roger Mayer effects pedal history! Roger Mayer's Classic Fuzz incorporates the same modifications that he developed for Jimi Hendrix and can be heard on his early recordings. "Unquestionably the most accurate "Vintage fuzz effect" that replicates the sound of the early Hendrix tracks". This unit is in excellent condition with minor wear & tear marks. Please see the attached high-resolution images as these form part of the items condition & originality description. Worldwide tracked shipping! 'Pedal Pawn' stock the UK's largest supply of vintage, rare & original stompboxes. Whether you're chasing your dream guitar pedal, or just simply want to nerd-out over gear - we'd love to hear from you at Pedal Pawn! As options go, this pedal has the "clock" graphics, and the On/Off Fuzz pot option. There is nothing on here that negatively impacts tone (LED's, the noisier Sundial knob, power jack, etc.). For your consideration is an Analog Man Sun Face fuzz pedal, with a BC183 silicon transistor. Video demo of theDeep Trip BOG Fuzz. deep trip BOG. The BOG goes way beyong your typical Fuzz Face, crossing into early-Gilmour, Blue Cheer and Iron Butterfly territory. Although the core of the BOG is a modified Fuzz Face circuit, Deep Trip didn't stop there. Up for grabs is a freshly built clone of the Roger Mayer Axis fuzz. i suggest the One Spot. Dunlop JDF2 Fuzz Face. Built to the exact specifications of the Original Dallas-Arbiter Fuzz Face. list below. Demo Videos: Our in-depth video product demonstrations bring our showroom in to your living room. Germanium Fuzz Face FFM2. Mini Red Guitar Effects Pedal. OPEN BOX ITEM. PEDAL IS IN MINT CONDITION. This is a rare Donner Box edition.